An Israeli hospital in city of Ashkelon, in southern Israel, is forcing Palestinians to get off public buses to undergo a security check before allowing the vehicles to enter on hospital grounds, while Israeli passengers continue their passage uninterrupted. Haaretz news outlet reported, according to Ma’an, that the Association for Civil Rights in Israel and Physicians for Human Rights have documented that Palestinians who take Dan Badarom’s line 18 have to get off the public bus at the entrance to the Barzilai Medical Center and undergo a security check. After the security check, they are then picked back up when the bus exits the hospital to continue on its route. 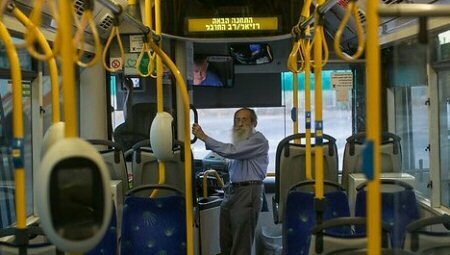 Haaretz published a video that showed a daily bus ride on line 18, during which the bus is seen stopping at the entrance to the hospital, a female security guard entering and then a number of Palestinian passengers exiting the bus with the guard, who doesn’t check any other passengers or force them to exit the bus. Reportedly, if Palestinians do not exit the bus themselves, they will be forced by the security guard off of the bus. Dan Badarom and the Barzilai hospital confirmed the details to be correct.